I have gathered feedback and gone through several handle iterations and have come up with a new design. I think it looks mint and the design feels Awesome in hand! 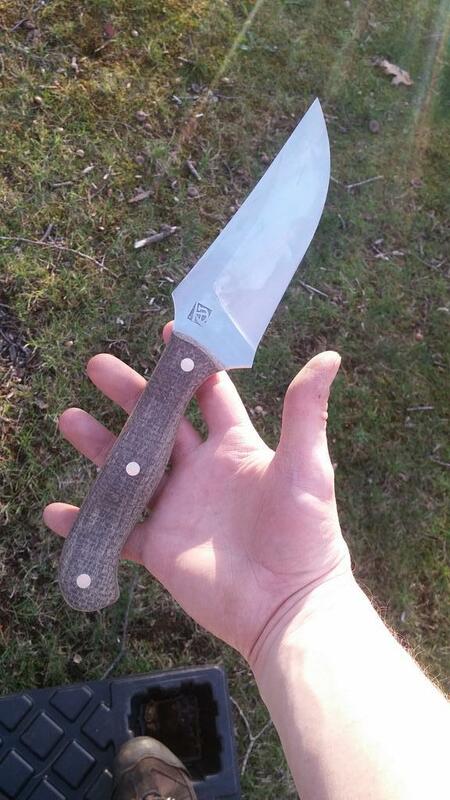 This model is a fusion between an all purpose utility knife, bushcrafting, camp/kitchen duty, classic drop point hunter...yeah all rolled into one. There is not one ounce of useless material in this design...it is lean and mean. I am also mixing in a couple scaled up versions, just about 15% bigger. I will have two of these in AEBL, possibly a Nitro V as well. All the heat treating for this batch will be done by Peters Heat Treating, shooting for Rc 62. These blades will also have cryogenics done to aid in wear resistance and strength. I've been thinking about a gp/camp knife, and was going to email you soon. So thanks for saving me the time. I'm in; if were talking a month or two the road? Are we given individual options on steel, or a majority wins batch more what you prefer? Without any research; I'd be interested in B#2 or w#2 as second.option. I will be sending in a large batch of blades for Heat Treat very soon. As far as completion date, I can put you at the end of my list for small blades. Hard to say exactly when that could be. June/July is possible for sure. I can do whatever steel you want, in the interest of time, either nitroV or AEBL would better as I have already profiled out some of those. Hitachi blue#2 and W2 are fine choices too. As for handle materials...sky is the limit. I have some awesome synthetic materials, very attractive stuff as well as a good selection of stabilized woods. Send me an email If you would like to iron out the details. Thanks Brian! AEB-L, 62 HRC, cryo-treatment = Sign me up for one! Done! The big boss agreed to Nitro-V for me! Looking forward to getting my hands on it! Well, you make your own decision! Based on what I read at the manufacturers website it sounded like a no-brainer to me. This may also enlighten others, since it's a relatively new product... and maybe keep Tim from having to answer as many questions. 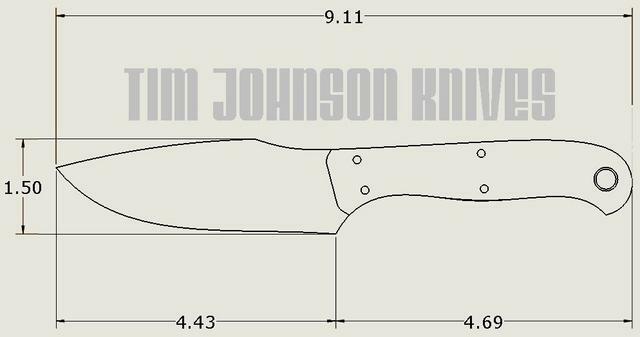 New Jersey Steel Baron wrote: The Baron’s Nitro-V is NJSB’s latest effort to provide premium cutlery grade steels and materials in an ever expanding, evolving craft that is custom tailored to our customers’ wants and needs. As a martensitic stainless steel with a chromium based chemistry, we have optimized the best qualities of AEB-L by enriching the formula using Nitrogen and Vanadium to create a new ferroalloy that provides exceptional edge performance, high hardness and extreme corrosion resistance especially in marine and wet environments. As leaders in the knife steel supply world, we recognize the ever-present demand not only for steel specifically formulated to suit the cutlery industry, but our customers’ desires to stay on the cutting edge of steel that is tough and versatile enough for pocket, kitchen, hunting, fishing; and tactical knives. We also understand that, with the wide range of boutique “super steels” already available, that the utmost concern of the hard working people we supply is to have a reasonably priced, high performance option that can match their needs, regardless their styles, niches, and patrons. This is just one small step in The Baron’s ever growing efforts as a part of this industry and its community–with Nitro-V, you can be assured that it is every bit the poster child for NJSB’s commitment to quality, integrity, and ingenuity. Welcome to the next level. If it is "optimized" AEB-L, lemme have it! One of the concerns I expressed to Tim in an email was that I do lots of rafting, kayaking and camping, so the knife will be at risk of rust and corrosion. For me it seemed like a perfect fit. I am also still considering the B#2 and a special offering Tim threw at me in an email; SS clad 52100. He is sending me a knife (a BFK) to test and play with that is made from 52100. 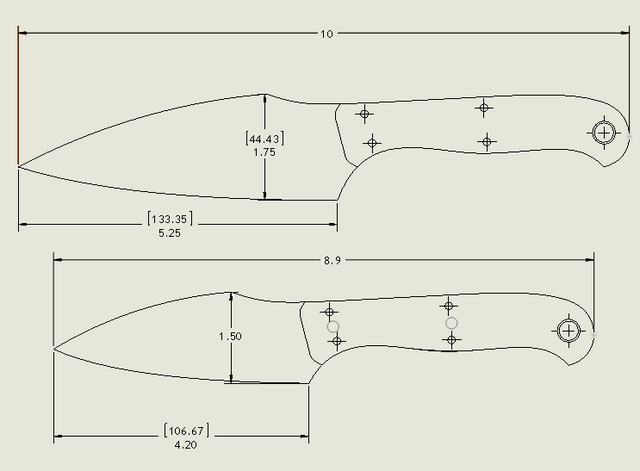 I am looking at having Tim (eventually) make me three knives, and this will be the middle/medium one. The BFK he is sending for testing is possibly the large one. Ok so I have two AEBL blades available of these. I just made a version of this knife with a DEBA shape blade. Gonna make a couple for my fishing club buddies. Much more versatile than a filet knife. WHY I HAVE I NOT THOUGHT OF THIS BEFORE? a western handled DEBA? of course! If you have an interest drop me a line, I can throw a couple in with my next heat treat batch. ahhh, Ok reading up a bit more ..I guess these are more like western handled funayuki, since they are precisely to take out on a boat...i guess it makes more sense.